Meet Andy Cummings, Lerner’s new Editor in Chief! First, tell us a little bit about yourself. I am a Midwesterner and grew up in Wisconsin just 20 minutes from Lambeau Field. So, yes I am a Packers fan but I look forward to seeing a Vikings game in that remarkable stadium. I have been involved in media from a young age. I was a sports reporter for my local paper from age 15 and have worked in publishing for over 35 years (I think I just gave away my age). I attended Northwestern and the University of Missouri where I earned a master’s degree in Media Management. I have worked and lived in Chicago, North Carolina, Poland, Missouri, Indiana, and now Minnesota. I am married with three kids—two boys in college and my daughter will join them soon. How did you get into book publishing? Like many things, it was a combination of fortunate events. I had been working in media in Indiana but looking for a new challenge. In graduate school, I paid my tuition by setting up and running a new computer research lab. I wrote and edited the documentation for students and professors. With that background in technical writing, I discovered a start-up publisher in Indianapolis that had just released the first Dummies title with a tech focus. I joined the team as employee #30. We grew rapidly and expanded globally for the next 20 years. It was a roller coaster with many more ups than downs. My last role was leading our technology publishing program as well as spearheading digital initiatives for the Dummies brand. What have been some of your favorite projects or books to work on? I have been fortunate to work on so many interesting projects. My first books as editor included working with emerging tech superstar author David Pogue on both Mac Secrets (1,200 pages edited in 30 days!) and Macs For Dummies. On the latter title, we put a 2nd title page under the cover called Macintosh Methodologies in Theory and Practice, so users could tear off the Dummies cover and show that 2nd cover if they wanted to show their peers or teachers that it was a *serious* book. More recently, we introduced the first children’s titles from our company [John Wiley & Sons, which acquired Dummies in 2001] in over 200 years that were focused on STEAM topics and the initial titles became bestsellers. I am looking forward to working on many new educational projects at Lerner. What were your favorite books as a kid? What are some favorite books you’ve read recently? I read many, many sports narratives and stat books. I also loved and still love history books. I also read every book from Stephen King—even though some of them kept me up at night! Say you’re trapped on a desert island—what 5 books would you want with you? Start with WHY (Simon Sinek). The Old Man and the Sea (Ernest Hemingway). The Book Thief (Markus Zusak). Shadow of the Wind (Carlos Ruiz Zafón). Cat’s Cradle (Kurt Vonnegut). You moved to Minneapolis from Indianapolis in January. How do you like Minnesota so far? We are thoroughly enjoying the area. We have several close family friends who live here and it is terrific to catch up and see the sites with them. 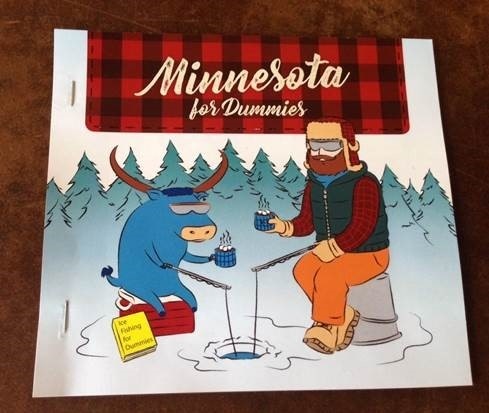 I am grateful that the Lerner staff provided an early education for me with a custom-made Minnesota for Dummies title the made sure that I understand critical issues and terminology. I am looking forward to exploring the many greenways and trails. Finally, we look forward to enjoying the rich arts community in the area. Speaking of things other than reading, what are your hobbies? My wife and I love to be outdoors with our goofy and energetic (meaning misbehaved) rescue dog, Inka. We also volunteer for causes important to us. I am a prison literacy reading coach, food pantry volunteer, Boy Scout counselor, and volunteer for Junior Achievement. Fun to speculate … likely a high school teacher, or a guide to the mountains in Zakopane, Poland (preferably both! ).